Arcoxia may be used to reduce inflammatory pain and swelling caused by inflammatory conditions of the joints and muscles, and short-lasting pain of moderate intensity following dental surgery. Can I buy Arcoxia online? 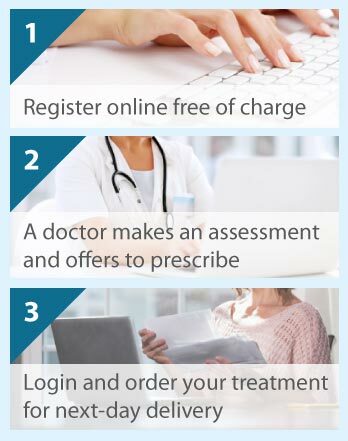 The Online Clinic can prescribe Arcoxia for you if you complete a short online questionnaire about your health background. A doctor will review the consultation form shortly after it is submitted and offer to prescribe medication if appropriate. The active substance in Arcoxia is etoricoxib. This medicine is known as a non-steroidal anti-inflammatory drug (NSAID) and, more specifically, a selective COX-2 inhibitor. These facilitate a reduction in the pain and swelling caused by inflammation of the joints and muscles due to inflammatory conditions (such as rheumatoid arthritis, osteoarthritis, ankylosing spondylitis, and gout), and moderate pain following dental surgery. NSAIDs do this by inhibiting an enzyme (COX) involved in prostaglandin production, which facilitates inflammation and pain associated with injuries and some diseases. Arcoxia is taken by mouth, once a day. It can be taken with or without a meal. The Arcoxia dose will depend on your condition and will be the lowest dose required to control your pain and inflammation. The recommended dose for rheumatoid arthritis and ankylosing spondylitis is 90 mg daily; for osteoarthritis is 30–60 mg daily; for gout is 120 mg daily for 8 days maximum; and for dental surgery pain is 90 mg for 3 days maximum. If you have liver disease you will be limited to a dose of 30–60 mg, depending on severity. It is advised that you take this medicine only for acute pain and only for as long as you need to because it can increase your risk of a heart attack or stroke, particularly at high doses. Your doctor will tell you exactly how much Arcoxia to take and for how long. If you do miss a dose, leave it and continue the next day; if you take too many tablets, get medical assistance immediately. Arcoxia can be used by individuals aged 16 years and older who suffer with pain and swelling of the joints and muscles from rheumatoid arthritis, osteoarthritis, ankylosing spondylitis, gout, and with dental pain (post surgery). There are some conditions that prohibit the use of Arcoxia. These include allergy to etoricoxib, other ingredients of Arcoxia, or other NSAIDs, or if you have a stomach ulcer, intestinal bleeding, inflammatory bowel disease, liver or kidney disease, blood pressure that is not appropriately medicine controlled, heart or blood vessel disease, or have had a stroke or heart attack. Your doctor will also want to know if you have had any of these aforementioned conditions, or if you have an infection, swelling, dehydration, high cholesterol, diabetes, or smoke, or if you are aged 65 years or more. Arcoxia should not be taken by women who are trying for a baby, pregnant or breast feeding. Let your doctor know about your current medication, particularly anticoagulants (blood thinners), antibiotics, diuretics, aspirin and other NSAIDs, hormone replacement therapy and contraceptive pills, agents that suppress the immune system, and medicines used to treat depression, high blood pressure, heart failure, and asthma. Stomach pain, swollen legs and feet, headache, dizziness, rapid and irregular heartbeat, increased blood pressure, changes in breathing, digestive problems (e.g., feeling/being sick, indigestion, constipation, and diarrhoea), bruising, and tiredness are common side effects of Arcoxia. Some people show changes in appetite, body weight, their blood, and sleep pattern, or become anxious or depressed, cough, have muscle cramps/stiffness/pain, kidney problems, itchy and red eyes, blurred vision, problems with their heart, chest tightness, heart attack, or a stroke. Rarely, individuals develop swelling of their face, tongue, lips, or throat (i.e., an allergy to Arcoxia), liver problems, severe skin conditions, or become confused. If you become short of breath or develop an allergy to Arcoxia, or have chest or severe/continuous stomach pain, ankle swelling, yellowish skin and eyes, or black faeces, or about any other signs or symptoms, stop taking Arcoxia and contact a doctor as soon as possible. Please complete a consultation form so that we can assess you for pain management medication. It may be that Arcoxia is not the most appropriate one for you and we can make a different recommendation.